I’ve done a lot of commissions over the years. Most I just make and then ship off. I don’t even get photos because it seems that I’m always on the edge of the deadline. So no time to shoot photos. I have to hustle to get it packed and shipped. I want to make a couple posts about commissions because they illustrate the versatility of this medium. I know I sound like a broken record at times, but I’ll say this again. 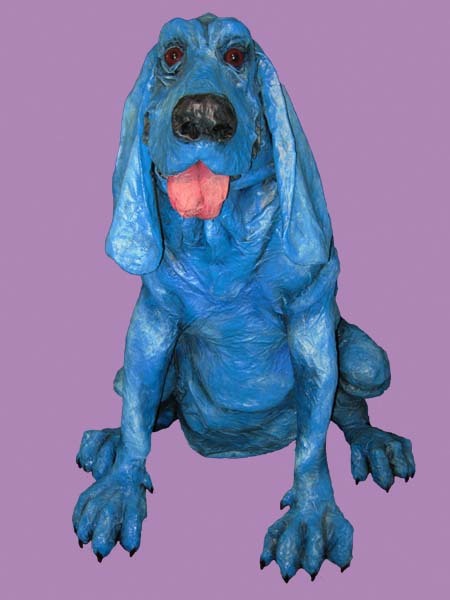 Paper mache is simply the ideal vehicle for artistic self-expression. 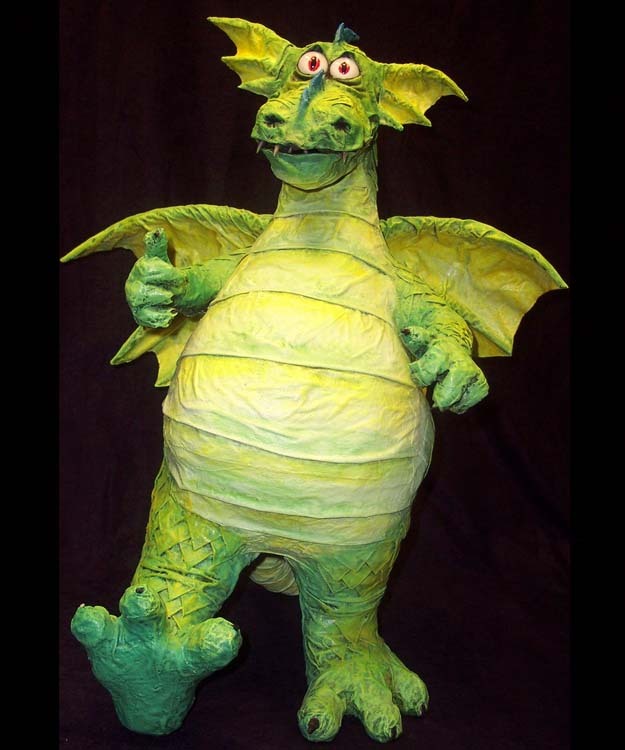 Besides, people think that all I make is dragons. This is a chance to showcase the other kinds of project I do. First, a commission I did for Todd McFarlane. 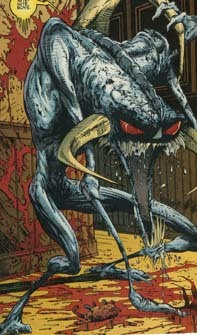 The former Spider Man artist developed a somewhat disturbing but wonderfully illustrated comic book called, “Spawn”. 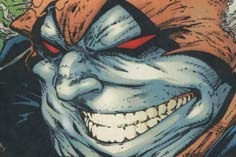 The main, evil character in the plot is named “Violator”. 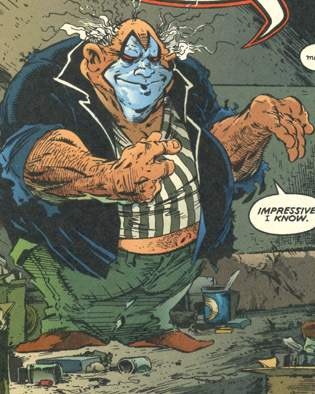 Violator is a shape shifter. 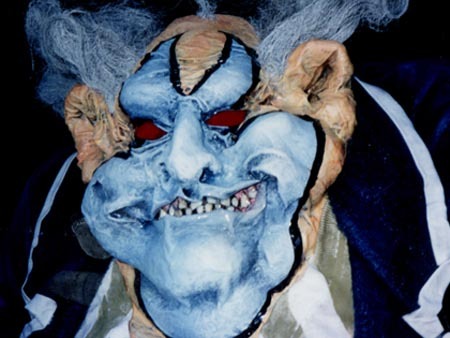 He appears as a demonic little clown (I know what some of you are thinking, “Aren’t all clowns demonic?”) that transforms into a tall, thin monster who pulls out the beating hearts of people he terrorizes. Not the kind of story you read to your child at bedtime. Todd saw my work in a gallery in Portland, Oregon and asked if I would make Violator for him, in both of his personas. 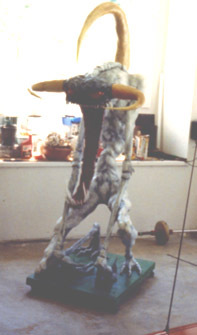 He wanted to take these 3D renditions to comic book conventions to help promote Spawn. I loved this challenge! It is a very difficult thing to do, to make a realistic versions of 2D illustrations. I started with the clown. Challenges? The hair. The eyes (glowing red orbs). The teeth. The clothes. The attitude. Here he is in cartoon form, and then my paper mache rendition. I used a wig that I sprayed with glue for the hair. I used red glass for the eyes. And I used human teeth (I have dentist friends). I used my own underwear. And I used my own hair (off the top of my head!) for his chest, belly, and arm hair. I think it turned out better than expected. 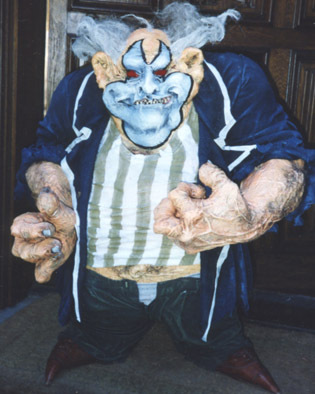 Next, his big Violator counterpart along with my paper mache version. Now I apologize for the quality of the photo. As I mentioned earlier, I finished this project the day I was supposed to deliver the piece. I had to quickly pack up and drive to a different state. I could kick myself for not getting better photos. But, in my defense, this was before the days of digital photos. Phones didn’t take photos. You needed a film camera, with film, that you had to take someplace to develop. I did have a camera in the car and was able to snap this one photo in his garage before I left. Challenges? Tall and skinny (stresses on joints). The eyes (bigger red orbs). Long horns. Teeth. Loooong jaw. See, terrible photo. But you can kind of make it out. Trust me. It was six feet tall, and cool. Another project I made from a cartoon was something you’ve seen in other places on this site and on my blog. 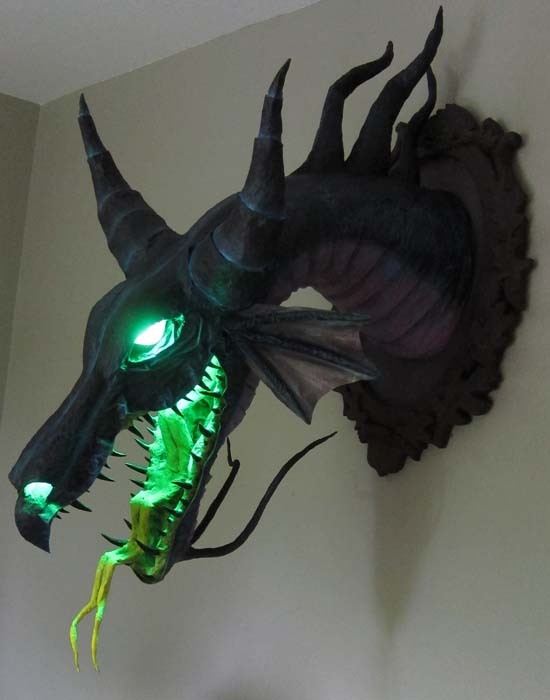 A Disney fan from France wanted a rendition of “Maleficent” from the original movie, “Sleeping Beauty”, circa 1959. He wanted just a trophy with lights in the appropriate places. Here is the only photo he sent. Not much to work from. 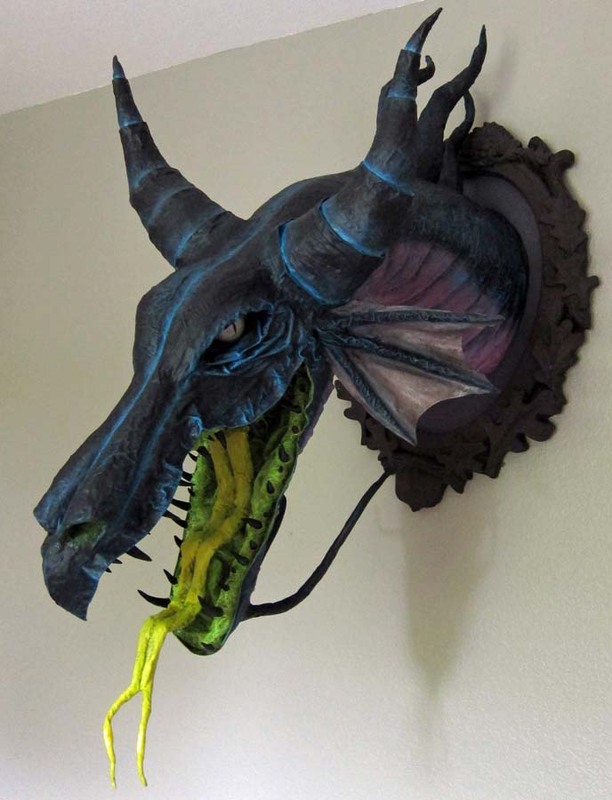 Here is my paper mache version. I used l.e.d. lights for the eyes, mouth, and nose. While I could never match the blazing lights in the cartoon, I think the effect worked. Of course most of the time this trophy hangs on the wall without the lights on. They are battery operated. So the trophy needed to look good in the light of day with the lights turned off. Here is what it looks like with the lights off. I have to say that my first “viral” experience came with the posting of this photo on my blog. It got picked up on Reddit, then sent to other blogs, then everywhere. I had, literally, hundreds of offers to buy her. I was very flattered. But I also have to say here that I don’t make duplicate projects, for lots of reasons. The biggest is that, when I make a commission for someone, they expect it to be unique. 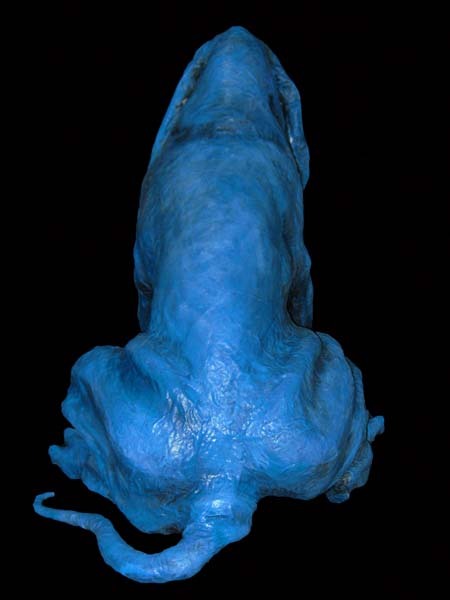 I sell one-of-a-kind pieces of sculpture. Second, I couldn’t make a second project exactly like the first even if I wanted to. It would just offer a comparison that I don’t want. One would be a better rendition than the other. And third, there are just too many other projects I want to make. I have no interest in making the same thing twice. What fun is that? That doesn’t mean that I won’t make something along the same lines or a variation on a theme. 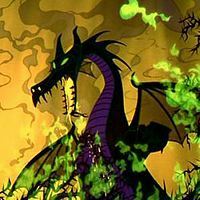 I did make “Son of Maleficent.” You can see the video on Youtube (http://youtu.be/_37uwY2njss). He is, in many ways, better than his mother. He is bigger, badder, and has more lights. But it isn’t Maleficent. So it didn’t get nearly the attention she received. Finally, here is a dog I made for a radio personality in Houston, Texas. 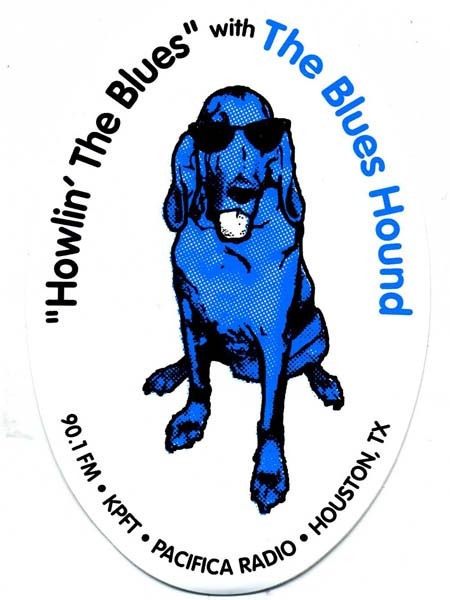 He has a show called “Howlin the Blues” with “The Blues Hound” (his radio moniker). 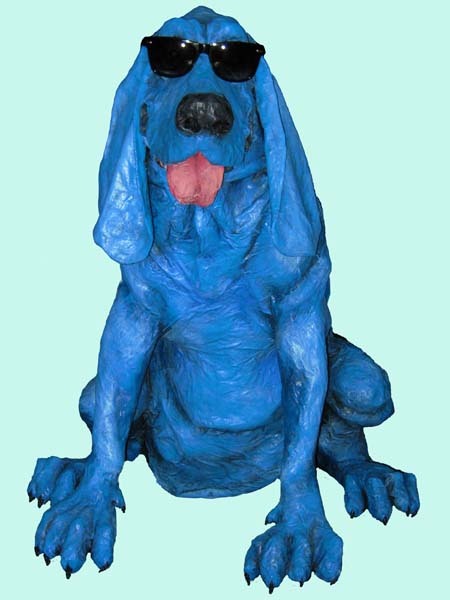 He wanted a blue dog that looked like his hound dog. He had a 2D version for me to use and some photos of his dog. Sorry, I can’t find those. Don’t know where they went. 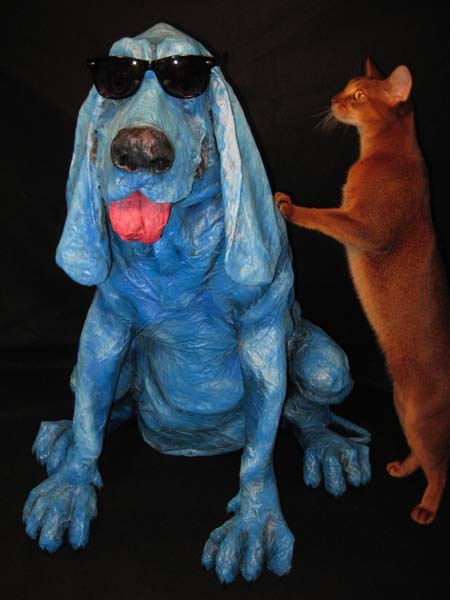 Here is my paper mache version. Here he is with Eddie (for scale). Finally, I decided to commission myself. 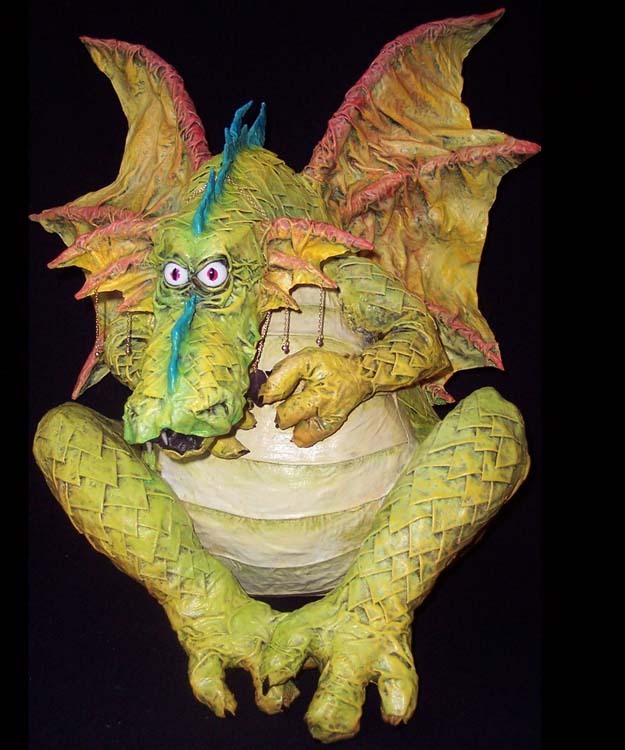 As the author of a cute little children’s book, Williams Treasure, I wanted paper mache renditions of the drawings I made in the book. I’m not a particularly adept 2D artist, but I think the drawings I came up with worked. They captured the personalities of the personas of William as the book progressed. The real challenge was trying to capture that same personality using my paper mache techniques. 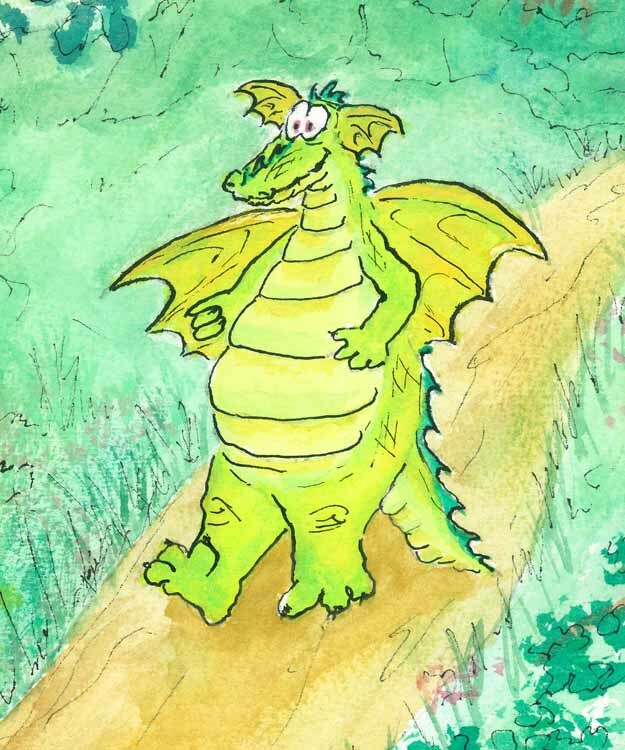 The book opens with a happy-go-lucky, care-free William wandering the hills and valleys of his home. The story goes that one day William sees a light over the horizon. It turns out to be a mega-store, a mall, smack dab in the middle of paradise! 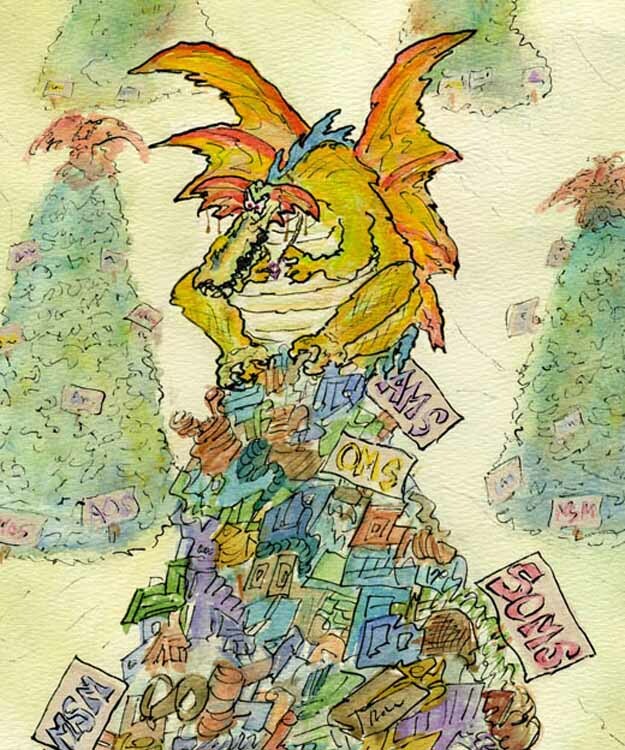 William is seduced into entering, and then, being a dragon, starts collecting “stuff”. Over time he accumulates a small pile, which grows, and grows. Well, if you are an American, you know what I mean. At first it’s all really fun. But over time, as the pile grows, William’s stuff becomes more of a problem than a source of joy. Eventually the pile becomes enormous. And William changes, on the inside, and on the outside. 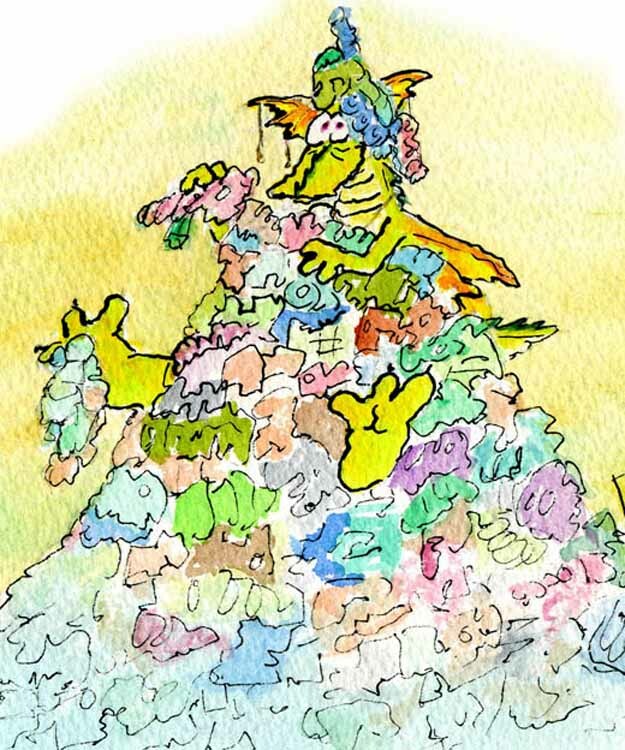 Here he is in my book, in a room full of other dragons on their piles. And here is my worried, greedy, unhappy, paper mache William.